"This is a tasty, low-fat soup. It's all vegetables, beans and rice so there's not a lot of calories, either. You can replace the soy sauce with low sodium soy sauce, if desired." This was delicious! I've made it a few times, changing some of the ingredients. I like omitting the potato and rice and adding 1/2 cup of barley instead. Freezes well. Excellent soup! I used elbow macaroni instead of rice, added 2 cups of beef broth, & some rosemary. 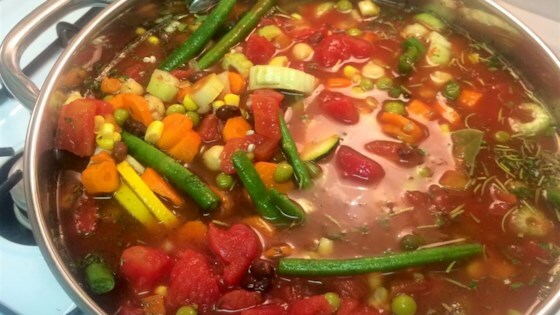 A really hearty soup that had them coming back for more! Thank you for the great recipe! very good soup!! I put green beans instead of peas (i hate peas) and I also added black beans. Oh and I used orzo instead of white rice. thanks for the recipe! !